NEW YORK, Jan 3, (KUNA): Kuwait’s Permanent Representative to the United Nations Ambassador Mansour Al-Otaibi said Wednesday that Kuwait’s accession to the Security Council is considered a major achievement of the Kuwaiti foreign policy, as it is considered one of the most important United Nations organs tasked with maintaining international peace and security where its decisions are binding. 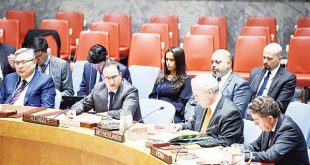 Al-Otaibi told Kuwait News Agency (KUNA) in an exclusive interview on the occasion of the commencement of Kuwait’s work in the Security Council as a non-permanent member for the years 2018-2019 that the importance of the Security Council lies in ensuring that its basic functions affect the security and stability of states and the prevention of conflicts, besides it is not easy to attain a membership as a majority of two-thirds of the General Assembly votes are needed He added that the most important and outstanding achievement is what will be achieved during the term of membership, especially that the Council is currently pursuing great responsibilities and issues of concern to the State of Kuwait, as most of the issues on the agenda concern the Arab countries such as Palestine, Yemen, Syria and Iraq are issues also affecting the security of Kuwait and the region in general. 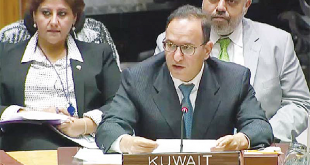 Al-Otaibi said that membership of the Security Council is important to highlight the role of Kuwait and its support for preventive diplomacy, resolving conflicts through peaceful means and contributing to humanitarian issues that have implications on international peace and security, especially that each crisis produces subsequent humanitarian crises. He stressed that Kuwait will take its responsibilities seriously and will cooperate with all members in accomplishing the Security Council’s tasks and responsibilities, affirming that Kuwait is one of the strongest supporters and defenders of the Charter of the United Nations, international law and the goals and principles of the United Nations and will continue doing so. Al-Otaibi pointed out that the membership of Kuwait comes at a difficult time, especially since many countries in the Arab and Islamic world are witnessing continuous conflicts for several years which have negative repercussions on security and stability in the region. He expressed hope that Kuwait will contribute through its membership in the Security Council and its presidency of the Council for February to contribute to the provision of security and stability, especially between the Arab and Islamic countries. 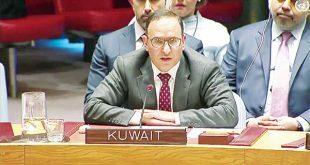 He said that Kuwait will take over the Security Council’s Working Group on Documentation and Procedures in the Security Council, saying the team will carry out tasks and responsibilities that are very important to the work of the Security Council, pointing out that it will try to build on the previous presidencies and at the same time will come up with new ideas and will push for their approval in order to enhance its mechanisms. 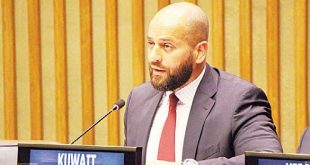 Al-Otaibi said that Kuwait’s priorities during its membership will be focused on four dimensions; the humanitarian dimension, the prevention of conflicts and improvement of the working methods of the Council, as well as preventive diplomacy. Meanwhile, after the State of Kuwait officially took over as a nonpermanent member of the UN Security Council yesterday, its flag was hoisted alongside those of the other 14 members. 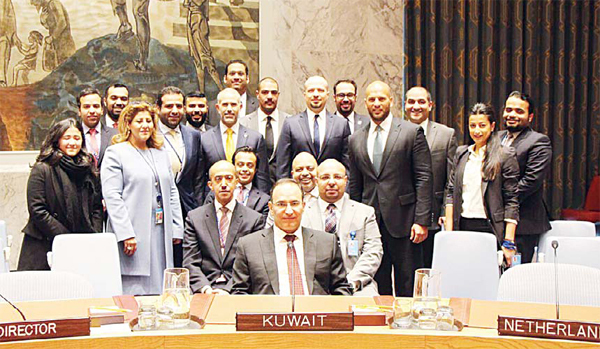 Kuwait’s Permanent Representative Ambassador Mansour Al-Otaibi raised his country’s flag on Tuesday at a ceremony that gathered a large number of diplomats, including representatives of the UNSC members, and press people. 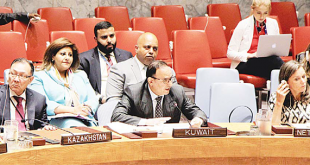 Kuwait was elected to the Council during a UN General Assembly session on last June 2 for the 2018-2019 term, representing Asia-Pacific, four decade after its first membership. It first served as UNSC nonpermanent member in 1978-1979. Kuwait is replacing Egypt as representative the Arab group of states at the Council. 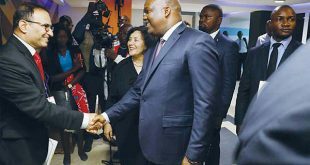 The other nine non-permanent members elected alongside Kuwait are; Bolivia (2018), Cote d’Ivoire (2019), Equatorial Guinea (2019), Ethiopia (2018), Kazakhstan (2018), Netherlands (2018), Peru (2019), Poland (2019) and Sweden (2018). 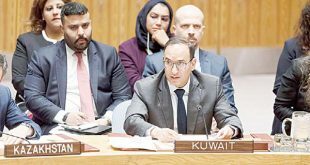 Kuwait’s agenda for the two-year membership focuses on Arab issues, notably Palestine, peacemaking, prevention of conflict, humanitarian issues, and enhancing the efficacy and transparency of the UNSC.